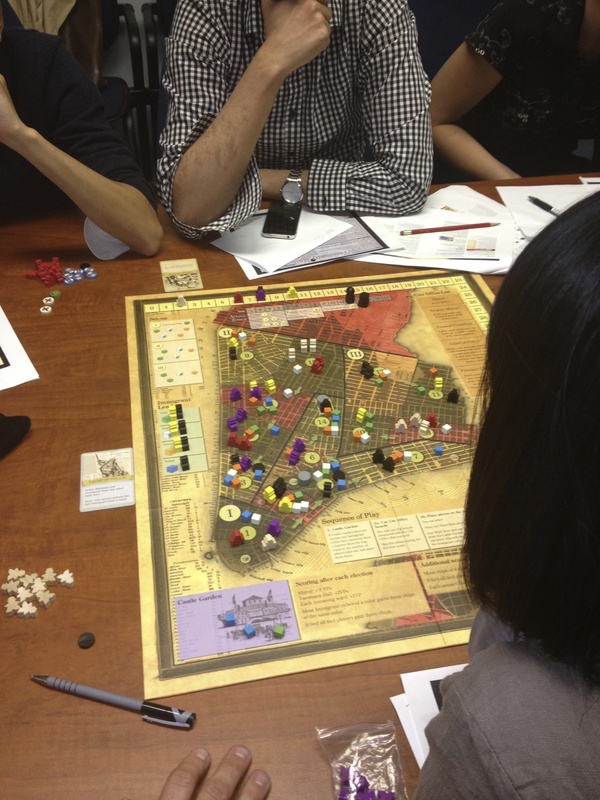 McGill University was the scene of a five player game of Tammany Hall yesterday. It was the first time we had tried the game since I had purchased it, and we weren’t disappointed. While the basic moves each player can take are limited, the strategic calculus involved is rich, complex, and deep. As the box promises, there is also a great deal of wheeling-and-dealing, promises, back-stabbing, and sheer duplicitousness. The first four years of New York politics saw a fairly close race between the five sides, although Councillor Wood misread some rules and ended up with little electoral support or influence—a deficit he was never able to overcome. 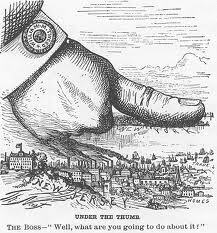 During the elections, Black reneged on a no-compete agreement with Red to take control of Ward #14 (Tammany Hall). Overall the Year Four elections were a tie, so no mayor was chosen or city offices assigned. Leadership of the various immigrant groups was fairly widely spread among the players. The Year Eight elections ended up with a win for the Yellow Party. More importantly, Yellow and Black emerged as leaders in all four ethnic communities, and thus began to pile up a considerable lead in influence. Mayor Yellow assigned the office of Council President to Councillor Black, who quickly used his new powers to lock up the strategic (and, at this point in the game, immigrant-rich) wards #4 and #14 (above). This helped propel Black into the Mayor’s office in the Year 12 elections, as well as a lead in total victory points. Mayor Black also won leadership of three of the four immigrant communities. This provided enough political influence to fend off challenges in the last four years of the game. The final Year Sixteen elections saw Mayor Black win again, securing an overall Black victory.